Mark Viner is recognized as one of the most exciting British concert pianists of his generation and is becoming increasingly well known for his bold championing of unfamiliar pianistic terrain. He studied at the Purcell School of Music and the Royal College where his principal teachers included Tessa Nicholson and Niel Immelman. 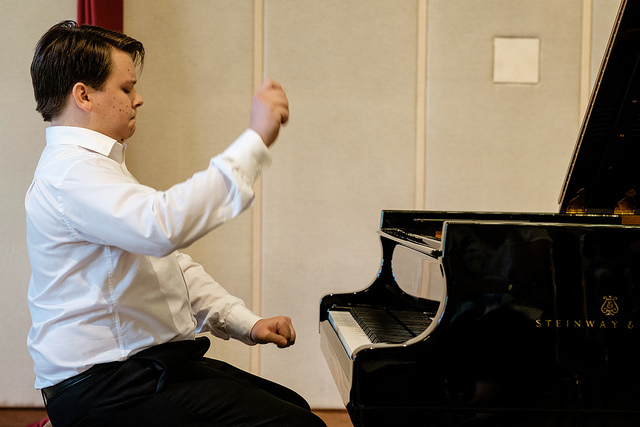 Having won first prize at the C.V. Alkan – P. J. G. Zimmerman International Piano Competition in Athens in 2012, his international engagements have flourished, he has been broadcast on German Radio and been invited to the Oxford Lieder Festival, Cheltenham Music Festival, ProPiano Hamburg and Husum Rarities of Piano Music in Germany. His recordings in recent years of Liszt, Thalberg, Alkan and Chaminade have won high praise. Mark was recently elected Chairman of the Alkan Society and of the British Liszt Society. He returns to Levoca after his highly successful recital here in 2016.